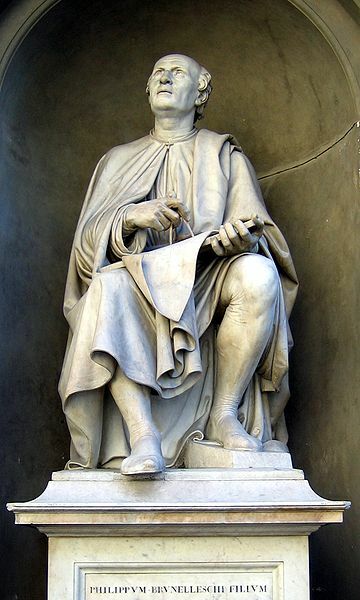 Filippo Brunelleschi, the genius who figured out how to build the spectacular octagonal dome of the Florence Cathedral, is often credited with inventing linear perspective around 1420. Actually, his great rival Lorenzo Ghiberti would beg to differ. So would the Arab mathemetician known as Alhazen, who lived around 965-1040. A copy of Alhazen’s work on the subject, with notes by Ghiberti, is in the Vatican Library. The ancient Greeks and Romans had the knowledge too, but it was lost in the Middle Ages. So Brunelleschi’s work was really more of a rediscovery. The kit consists of various frames and grids. If I had the patience to actually work with the kit, I could create more realistic paintings by establishing a vanishing point, a horizon line, and accurate diagonals. 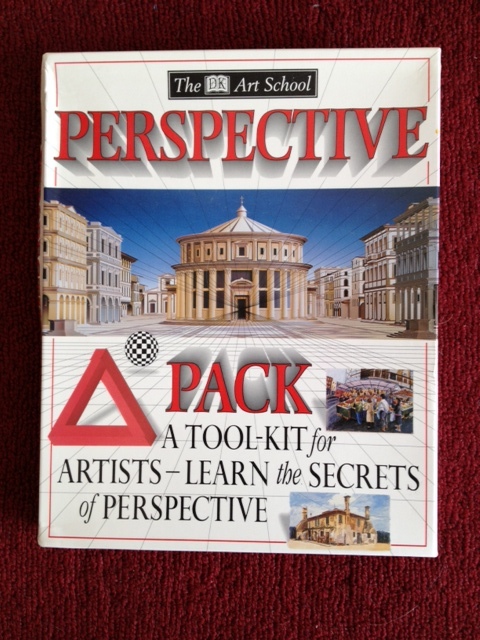 While writing about Filippo Brunelleschi, I realized that the illustration on the cover of my kit depicts the master’s famous demonstration of linear perspective. The building shown on the cover is the Baptistery of Florence. The hexagonal building stands directly across from the Florence Duomo. Brunelleschi stood in the doorway of the still-unfinished cathedral. Using the rediscovered calculations and techniques of perspective, he painted a very accurate picture of the Baptistery. (We could take a photo, but there were no cameras in his day). Then he poked a hole in the canvas and looked through the back of the canvas at a mirror. When he quickly moved the mirror away, the viewer could see how accurate the painting was. Very quickly, every Renaissance painter worth his salt began using the technique. It was part of the new realism that swept the art world after centuries of art that was much more symbolic than realistic. 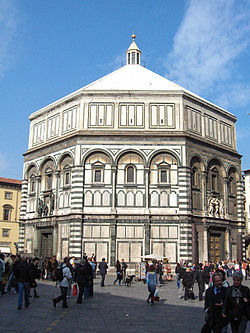 The Baptistery was constructed sometime between 1059 and 1128. Right up into the 19th century, this was the place every Florentine Catholic was baptized. In about 1400, new doors were needed. The city fathers held a competition for the plum job of creating bronze doors for this very important building. Brunelleschi was 21 at the time; Ghiberti was barely 20. The younger pup won. Ghiberti ended up working on these doors, plus a subsequent set, for pretty much the rest of his life. It took him 20 years to finish the first set of doors and 25 more years for the next set. Brunelleschi was disappointed; this may have been one reason he turned his talents to architecture and design. Personally, I think he was lucky he lost this competition. It enabled him to enter and win the one for the cathedral dome. Both men became famous and had illustrious, well-paid careers. But today, it is hard to fully appreciate Ghiberti’s work even when standing right in front of the doors. We’ve lost our taste for intricate bronze reliefs. Brunelleschi, on the other hand, got to spend 16 years on a complex project in the open air of Florence, while everyone in the city discussed and admired his work. Today, every visitor can admire the Duomo from countless vantage points in and around the city. The most famous image of Brunelleschi is a large statue that shows him gazing up at the crowning achievement of his life, the dome of the cathedral. Leonardo da Vinci remarked, “Perspective is the rein and rudder of painting.” Now, maybe I had better get that kit off the shelf and get to work painting. This entry was posted in Art, Explore Europe, Florence, Florence Sights, Italian History, Uncategorized and tagged Brunelleschi, da Vinci, Discovery of linear perspective, Florence Baptistery, Florence Duomo, Gates of Paradise, Ghiberti on April 20, 2013 by Claudia Suzan Carley. Thank you for evoking memories of my trip to Italy with my mom. It was terribly hot in Florence that June, but we were still entranced by the city.